Geoscouting is the partnership of Scouting and Geocaching to help promote recruiting, retention, advancement and public relations of your Scouting Pack, Troop or Crew. Geocaching is an entertaining adventure game for GPS users, with hundreds of thousands of active members in over 222 countries. It is a modified treasure hunt using GPS coordinates to locate the “prize” or cache. There are numerous public geocaches hidden around your community, probably very close to where you live. Many of these involve beautiful hikes and/or fun puzzles to solve to find the treasure. 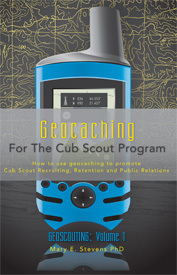 Geocaching can augment your Scouting program in a number of ways. Remember - Pathfinding has been part of Scouting from its very beginning. GPS technology provides an augmented compass and measuring system, which is an essential part of the increasingly technology oriented lives of this generation. Remember, however, that we are simply updating an old and traditional Scouting skill. We are not saying that the older methods should be forgotten. Map and compass skills are an invaluable supplement to any GPS use and the importance of these skills should be reinforced whenever possible. Most importantly, the Values of Scouting, including “Fun with a Purpose” are paramount to any Scouting activity. Geoscouting GPS coin is now available! 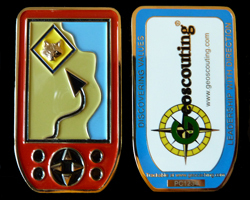 Geocaching Merit Badge Geocoin is now available! 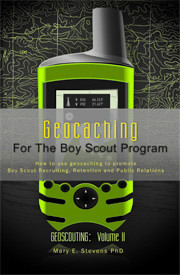 Geoscouting.com exists to help promote the use of Geocaching within the Scouting Movement. If you support this effort and want to help with our goals, use the Donate button below to show your appreciation.